Our new Health Profile for England tells us that as a society people are living longer. Life expectancy in England has reached 79.6 years for men and 83.2 for women and we’re healthier at every age group than ever before. However, long term conditions now account for 70% of total health and social care spending in England. Cardiovascular disease (CVD) is the name of a class of diseases that affect the heart or blood vessels, the most common being heart attacks and strokes. We want to encourage more people to understand their risk of this and take action to prevent it, which we know could lead to more people living healthier and longer lives. These risk factors are greater in lower socioeconomic groups, making CVD one of the conditions most strongly associated with health inequalities. As a result, premature death rates from CVD in the most deprived 10% of the population are almost twice as high as rates in the least deprived 10%. Prevention is one of our new Secretary of State’s highest priorities and is an area where we can make a huge difference to people lives, as well as our economy. This is very true for CVD and crucially, if people take action to address these risk factors then this will help prevent over 50 deaths a day - that’s one every 30 minutes. Investing in prevention also has the potential to reduce the staggering £9bn that CVD costs the NHS each year and alleviate the pressure on our already stretched health and social care services. 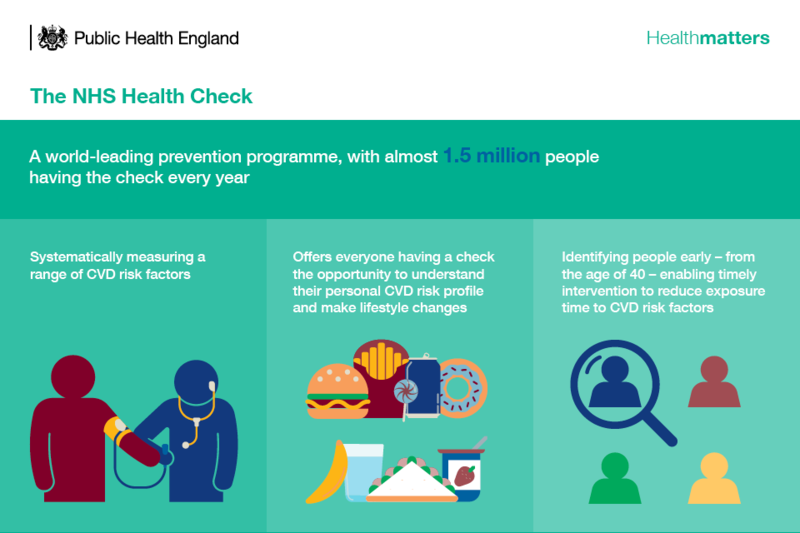 The NHS Health Check presents the ideal opportunity for health professionals to focus on CVD prevention. The programme aims to improve health and wellbeing of adults aged 40-74 years through the promotion of earlier awareness, assessment, and management of the major risk factors and conditions driving premature death, disability and health inequalities in England, including cardiovascular disease, diabetes, cancer, dementia and respiratory disease. It is one of the largest prevention programme in the world and has benefitted over seven million people in just over five years. Although the greatest burden of death and disability from CVD occurs among people over the age of 50, we have known for some time that CVD is not an inevitable part of the ageing process. The NHS Health Check offers an opportunity for people in midlife to assess their risk of CVD and find out about important lifestyle changes that can prevent and delay the onset of CVD. Currently just over half of all people invited have not taken up the offer, so we need to do more to ensure that as many as people as possible benefit from this vital check. As well as increasing the uptake of the NHS Health Check more work needs to be done to optimise the treatment of CVD and it’s principle risk factors. 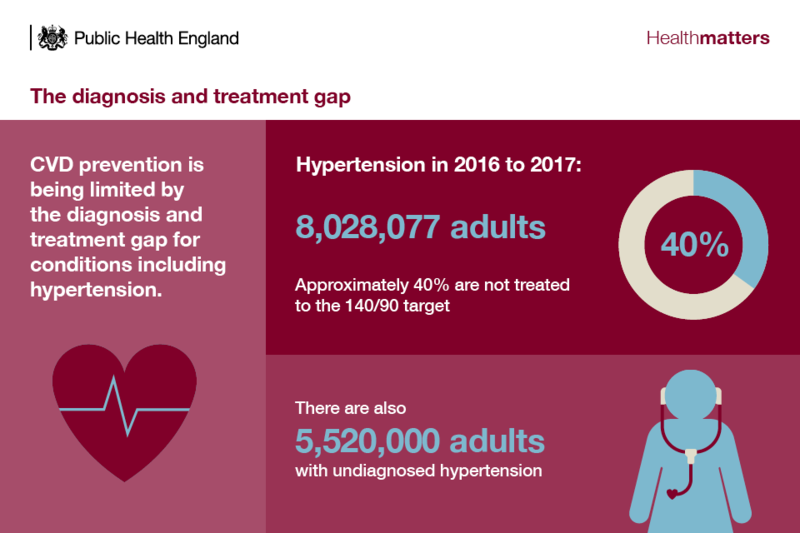 In England, CVD prevention is being limited by the treatment gap for major CVD risk conditions including high blood pressure, high cholesterol and atrial fibrillation, which cause many thousands of preventable heart attacks and strokes each year. Effective medications such as statins and antihypertensive drugs are widely available and should be prescribed to patients in line with NICE guidance. However, only 1 in 5 NHS Health Check attendees at high risk of CVD have been prescribed a statin and only 1 in 12 NHS Health Check attendees at high risk of CVD have been prescribed an antihypertensive. Although prescribing rates are higher than those who attend for a NHS Health Check, overall prescribing rates vary, and improving this provides an opportunity to increase the effectiveness of the programme significantly. This is one of the key areas being explored as part of the new NHS Long Term Plan, which PHE welcomes as an important means of preventing many thousands of preventable heart attacks, strokes and dementia cases across England. As well as ensuring that people get the right medication, it’s hugely important to ensure that they understand how to reduce their risk of CVD. 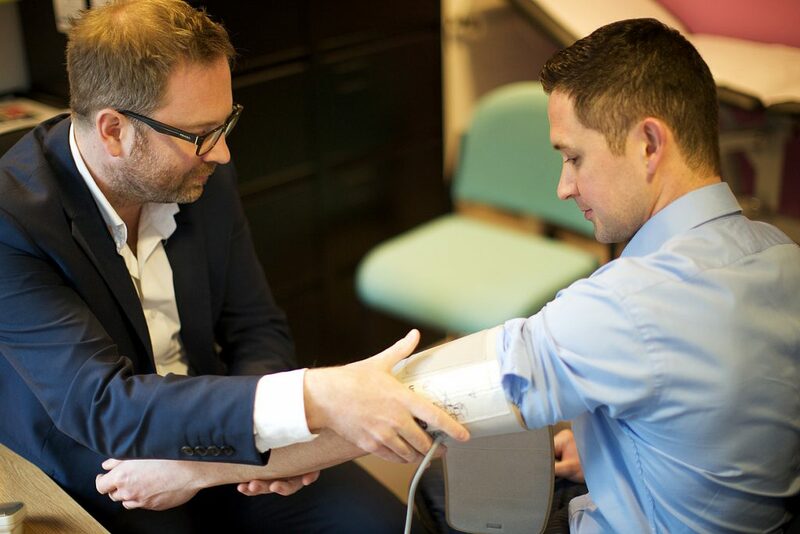 By using motivational interviewing techniques and signposting local lifestyle support services, health professionals can increase the likelihood that people will make important lifestyle changes to prevent-ill health, helping them lead healthier, longer lives. On top of the many strands of work mentioned above, it is important that we are working constantly to find new, innovative ways to help more people understand and reduce their risk of CVD. Our Heart Age Test is one way that everyone can learn more about their heart health and more importantly how to improve it. Since the relaunch of the test earlier this month, we have seen a huge increase not only in the number of completions but also the number of people accessing our lifestyle information and tools which help guide people on making important lifestyle changes which lower their risk. We know from other countries who have improved their treatment and management of CVD risk factors, such as Canada and the USA, that community mobilisation and access to information is hugely important. Access to health information is rapidly increasing and becoming part of normal life. Traditional medicine of doctors or other health professionals being the only route to access health information is no longer the way our system operates. Given that CVD remains one of the largest causes of preventable death, ill health and health inequalities in our country, there is a clear need for us to do more to correct this. Just doing the same things we have done for the last two or three decades will not lead to us righting a wrong, which is people should not be dying or living with largely preventable diseases such as CVD. The social injustice which we also know is unacceptable needs to be challenged if we are going to improve our outcomes related to CVD. By working together, the public, professionals and society as a whole, it is possible for us to make a difference to so many people’s lives now and for the future. Subscribe to our blog to receive email updates when new posts are published.